« iPad Screams for iStands! While on our recent trip, we stopped in Tennessee at an outlet mall. I shopped at a Reebok store and bought a pair of the new “toning shoes” that are supposed to work your gluts, hamstrings and lower legs to help better tone your muscles and help improve your fitness levels. Conceptually I applaud the new trend in walking shoes. Why? Because nowadays too many people walk on concrete-a flat unyielding surface that does not give or provide any instability for your lower legs and feet. What’s so great about instability? It allows your lower leg muscles to work harder and get stronger. This in turn can help your feet grow stronger, prevent potential lower leg/foot issues like sore heels or heel spurs and also gives your muscles a new way to work. Walking barefoot in sand or grass is also great but impractical in our times for many people. Note: As usual I am going to post my derriere-covering disclaimer here: I am not a doctor. Any info I post is either my own opinion or a summary of other articles written by medical personal with a link to the original article. WebMD weighs in on the toner shoes here. From a podiatrist point of view, the new shoes take pressure off the heel and give better support to the ankle. A Chicago doc says the shoes are not great for arthritis sufferers (which makes sense because arthritis is about joint inflammation, not about muscle tone). And most experts agree that the shoes should be broken in slowly. As in, don’t wear them for a 4 mile walk the first day you try them out! 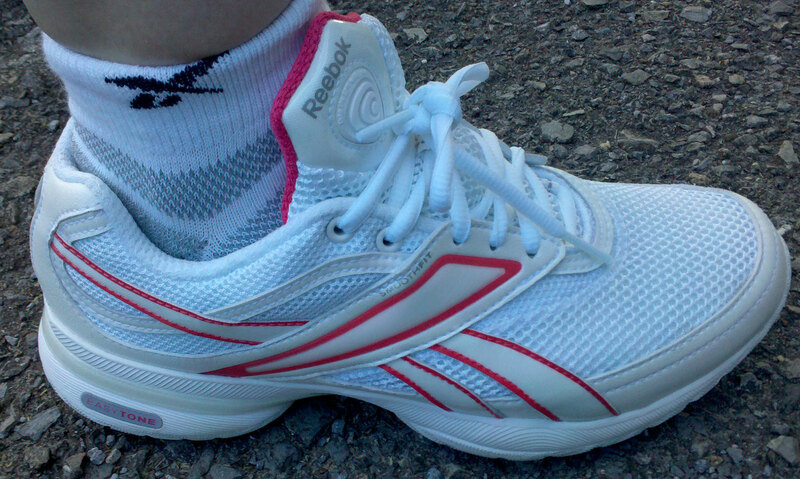 My Reebok Easy Tone shoes are super comfortable. They felt great from the moment I put them on until the moment I took them off. The Reebok brand is not as rounded and high as the other toner type shoes I’ve seen which was a plus to me. From afar they look like regular running or walking shoes. It’s only when you turn them over that you see the round “balls” underneath the pad of the foot and heel. These balls cause your foot to be slightly unstable. (Not “I am going to fall off my shoes” unstable, but more “I feel myself rocking a slight bit as I walk” unstable.) After a day of walking int he Easy Tones on concrete, my legs do feel different and I do feel more muscle “soreness” (slight) in my hams and gluts but also my lower legs. To me, this is a good sign of the shoes making me use my leg muscles differently! There’s an excellent You Tube video segment of the Today Show that shows three woman trying out the MBT’s, Skechers and Reebok versions of the shoes with a great explanation of how the shoes work along with a short segment on the former NASA engineer at Reebok that created their version of the shoe based on how a Bosu ball works. Check it out here. CNN’s experts don’t think much of the manufacturer’s claims that the shoes will be a substitute for the gym or regular workouts. on this I agree. Like any other immediate gratification fix, such claims are too good to be true. 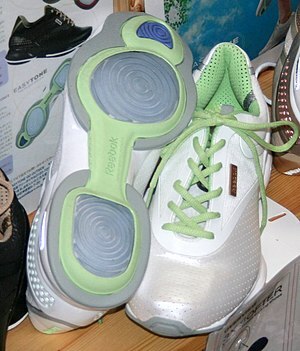 Plus you would likely have to significantly increase your walking time to get a real benefit from the shoes. For me, though, having the shoes in my “fitness arsenal” aka my shoe rack, gives me a way to work my lower legs and gluts as I walk around the city. The Associated Press gives a short rundown on the top toner shoes by brand here. The article is short but gives the basics abotu the top five selling brands of toning shoes. HubPages gives us this article about how Dr. Scholl got the toner idea first with his wooden sandals. I don’t know about you, but I had a few pair and I loved them way back when. The only way to lose weight is to exercise and reduce your caloric intake. But if wearing these shoes makes you walk more, then it’s a great tool in your fitness toolbox. If wearing these shoes makes you fall and twist your ankle or lose balance and fall or causes any foot or ankle pain, then don’t wear them! Do you have a pair of toning shoes? Tell us about your experience in the comment section! I wore a pair of FitFlops for over the past 5 months, and my feet and legs never felt tired from walking and standing hours each day. Before I could never be on my feet for more than 4 hours without pain. Also my legs and ankles swell when I’m on my feet a lot, but with the FitFlops I never had swelling! They were so comfortable, I never wanted to take them off. I’m planning to buy FitFlop clogs soon to get through the colder months. That’s a great testimonial for those shoes! I am so glad they are helping you with the swelling and leg pain. It’s amazing how simple changes can help (or hurt us). It’s like the Princess ad the Pea! And you are the princess! And the FitFlops get rid of the “pea” (discomfort).